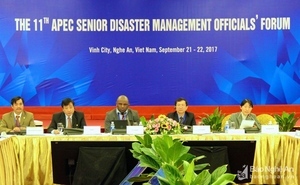 The 11th APEC Senior Disaster Management Officials Forum,SDMOF was held in Vinh City, northern Viet Nam on 21-22 September 2017 and Mr.Yoneda, Deputy Director General, Cabinet Office and Mr. Moriwaki, deputy director attended the meeting. 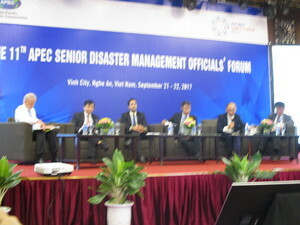 ED of ADRC attended in it as EPWG co-chair.The Forum was hosted by MARD, Viet Nam and officially opened by H.E. Hoang Van Thang, Vice Minister of Agriculture and Rural Development of Viet Nam, and H.E. Mr Dinh Viet Hong, Vice Chairman of the People's Committee of Nghe An Province. Approximately 160 participants from 16 economies participated in the meeting. In the first prenary session on successful cases of applyng advanced technologies and regional collaboration chaired by New Zealand, Mr.Yoneda, Deputy Director General, Cabinet Office, Japan made a presentation on use of ICT for DRR by highlighting J-ALERT, while Philippines, Chinese Taipei, and UNISDR Asia Pacific contributed to the Panel in addition to the host economy, Viet Nam. In the following three technical sessions, participants from member economies and research institutes, the private sector and international organizations provided their experiences on application of cutting edge technologies for DRR purposes. Based on the two days discussion, the final prenary session on Day2 discussed the draft of "Vinh Joint Declarations on Science and Technology for DRR--Enhancing science technology and cooperation to facilitate DRR decision support towards an effective policy making for upgrading DRR governance". The economies adopted the declaration at the end and the essence was integrated into the APEC 2017 Ministerial Meeting, Joint Ministerial Statement.